Every now and then, there occurs an event that lifts us out of our routine, somewhat self-absorbed lives and reminds us that there is a bigger, incredibly fascinating universe of which we are just a tiny part. Events that are rare and uncommon like the aurora or polar lights, frost flowers, super cells, fire whirls in a bush fire, water spouts, ball lightening, the chance to view Haley’s comet. Or, those that recur more widely but still powerful enough to get our attention every single time such as a solar eclipse, the annual migration of the Monarch butterflies, meteor showers, earthquakes, tsunamis, volcano eruptions, forest fires, tornadoes, hurricanes. Each of those occurrences , be they breathtakingly beautiful or devastatingly powerful, brings us down to our knees. We acknowledge forces at work mightier than ourselves. Our part in the big drama is made clear – we are not center stage. And so, this past weekend, just such an opportunity came my way. 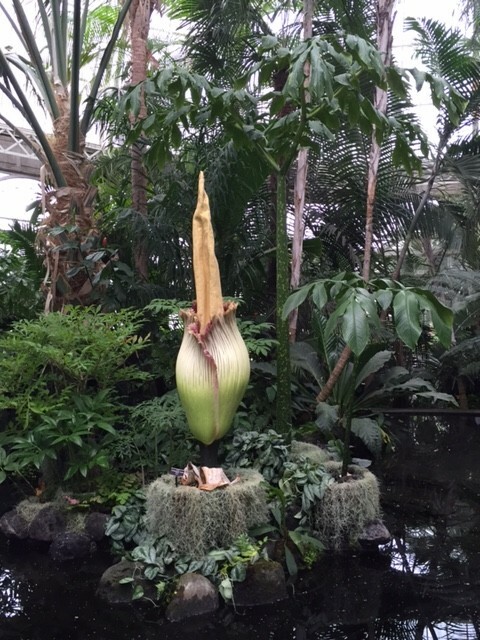 The corpse flower or titan-arum ( Amorphophallus titanum) at the NYBG was in bloom. The plant takes years and requires considerable energy to form buds and then, once there is a bud, the flower matures quickly. It opens over a period of 36 hours and then withers away. So the window to catch it in bloom is narrow. 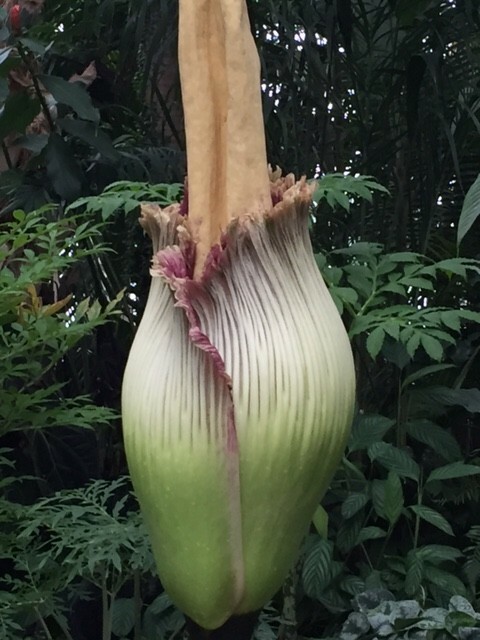 Its characteristic aroma of rotting flesh notwithstanding, the titan-arum is a sight to behold. I was not going to miss this event. After all who knows where I might be the next time it graces us with a flower! Standing in line along with so many others just as eager and curious as I, it occurred to me that when it comes down to it, we are all the same. Fellow humans trying to make sense of our world and in doing so, understand ourselves a little bit better. What a wonderful, diverse crowd I was privileged to be a part of as we wound our way through the conservatory and approached the guest of honor. Jockeying for a proper view, I heard a myriad of languages and I’m certain they were all saying the same thing – “ Wow! Look at that!”. There in the reflecting pool, rose the flower of the hour. 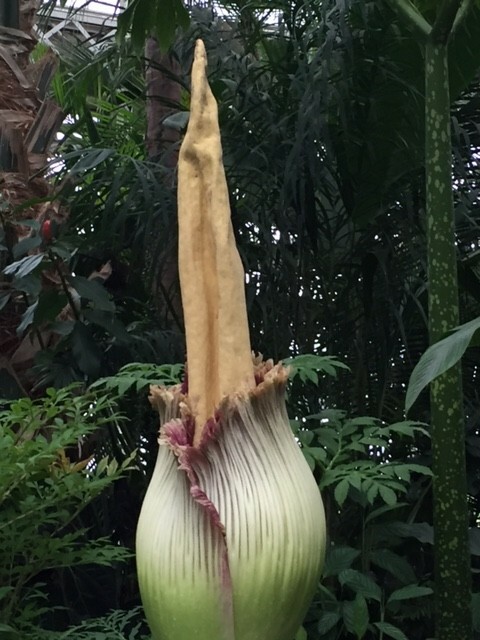 The spadix looked like a 7 foot finger pointing to the heavens above and the frilly spathe wrapped its base as elegantly as a Fortuny-pleated skirt. In green to cream ombre on the outside, the spathe opens out in a flare to reveal a deep red to maroon interior. It was not quite open when I was there. 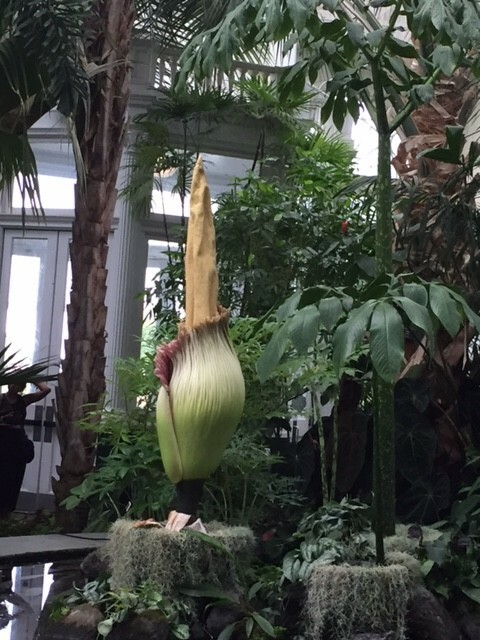 Even so, I felt quite blessed to have seen this once-in-a-long-while flower. For the fifteen minutes of audience I had, I was oblivious to the all the news that was being reported on our political goings-on, the dreary to-do list that lingered on my phone, the quotidian worries both real and imagined that dog us all and, the twinges and aches that I woke up with that morning. For that quarter hour, I was given the gift of stillness and a deep sense of connection to every living thing on this magical, blue planet. My take home message – it is worth the hard work and time to do something extraordinary. As for the famous odor? I hardly noticed. At a more accessible level, we are given daily and seasonal nudges to put our lives in perspective. Sunrises, sunsets, the smile of a baby as it reaches for your embrace, the honeybee making its daily rounds in the garden, the night sky glittering messages from distant galaxies, the periodic love song of the cicadas. We are equally seduced by rainbows and the autumnal colors of the leaves announcing the close of the growing season. The thawing earth pierced through by tiny, brave crocuses, the unfurling of the summer roses, the deepening blush of the apples in October, the tranquility of the first snowfall – all reminders that miracles happen all the time. We just have to become still and notice. Every time that happens, we become better versions of ourselves. All of this month, some of my botanical art and poems are on exhibit at the Ruth Keeler Memorial Library in North Salem NY. I hope you will visit! This entry was posted in All Gods Creatures, Deep thoughts by pgbundil. Bookmark the permalink. Thank you, Shobha, for this heavenly guided meditation.